I went back to Target and grabbed what was left of the first series of 1/55 Fast & Furious cars by Jada. I got Dom’s Charger in both street and off-road versions, Roman’s Camaro (off-road), and the Lykan Hypersport. Each of these cars comes with an additional part which allows you to piece together Brian’s white Supra from the end of the 7th movie. Collect all 6 cars in this series and you’ll have a complete Supra. The problem, of course, is finding the whole set. At my Target, the R34 and RoadRunner had already been taken. The R34 is a no-brainer as it is both collector and scalper-worthy. The RoadRunner comes with the body piece of the Supra, which I presume is the most desirable “extra” part. Nonetheless, I picked up the leftovers as I’m a huge F&F fan anyways. I’ll worry about piecing together the Supra later. They’re priced at $5.99, which is $2 more than a comparable 1/55 scale Jada. That extra cost likely comes from licensing and the inclusion of the extra part. First is Dom’s Charger in street guise. This one looks a bit on the cartoonish side. The wheels are huge and the proportions, especially the front end, doesn’t look quite right. I still like it a lot, though. I think it’s a lot more well done than, say, the Hot Wheels Retro Entertainment F&F Charger. The details are crisper, and those wheels look fantastic. Next is the same Charger, but in its off-road form. This time, it’s got the Hemi vinyl at the back, front and rear bumper guards, off-road wheels and tires, and an extra pair of wheels hitched to the trunk. This is my favorite of the four shown in this post, as ridiculous as it is. Again, I can’t stress enough how much I like Jada’s wheels. And the details are great throughout the car; even the windshield wipers are painted in silver. Both Chargers in this series seem to be pegwarmers. Another Target I visited only had the Chargers left. This is Roman’s off-road Camaro. It’s my least favorite of the bunch, and part of that is due to the fact that as I’ve grown older, I’ve started caring less about Camaros. Still, it’s not a bad piece at all. Last is the Lykan Hypersport. 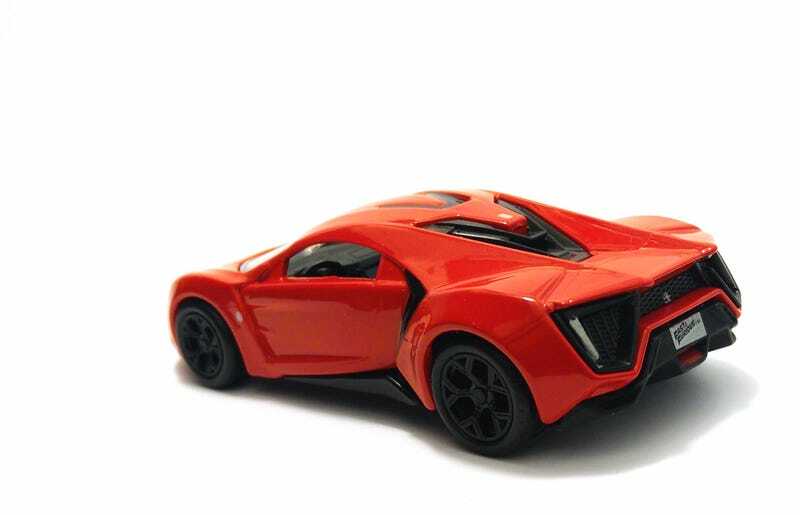 This might be the first Lykan in diecast, so I can imagine this one will be quite popular. Personally, I couldn’t care less about this car. It’s as generic as a hypercar can get. Despite that, this is a great cast. Many of the details on this car (the black parts) are done with separate plastic parts. The body lines are super crisp, and detailing is spot-on. Mine has a little blunder in that the left taillight is missing some silver paint. Overall, I’d say this is a must have. Those BBS-like racing wheels for the Supra are amazing. In terms of size, they’re the same as HW’s large rear wheels. Customizers, take note. If I’m never able to complete the Supra, I already have an idea where I’d utilize those wheels. But then I’d have to get another Lykan or find an R34 for the second pair.